Louisiana pro Nick LeBrun – fishing in his first career regular-season FLW Tour event – brought a massive 29-pound, 2-ounce five-bass limit to the scale Thursday to vault to the top of the leaderboard after Day One of the FLW Tour at Sam Rayburn Reservoir presented by Polaris. Fellow rookie Sam George of Athens, Alabama, sits in second place with five bass weighing 28.5 pounds. 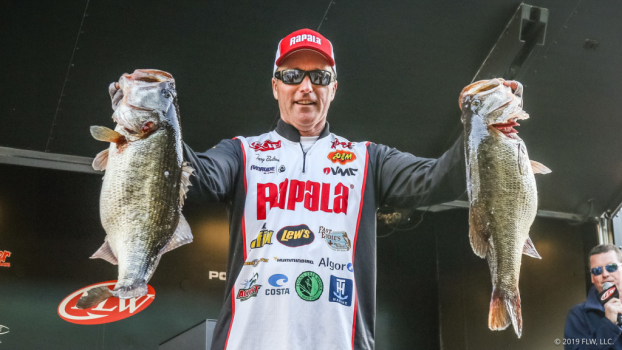 On Day 2 Rapala pro Terry Bolton of Benton, Kentucky, brought a five-bass limit to the scale Friday weighing 33 pounds, 9 ounces, replacing LeBrun at the top of the leaderboard after starting the day in 10th place. Bolton’s two day total of 10 bass weighing 54-3 will give him a 5-pound, 15-ounce advantage over second place over LeBrun. “I think I caught more fish today than I caught all last year on Tour,” joked Bolton, a 13-time FLW Cup qualifier. “It was a really special day. I had a pretty good day yesterday and this was the same place that I caught my big ones. There is bigger fish there and it’s just a timing deal. Bolton said that the fish are suspended, and he estimated that he caught more than 50 bass from the area on both Thursday and Friday. His baits of choice has been Rapala DT14 and Rapala DT16 crankbaits, in Demon and Caribbean Shad colors. “It’s just something that happens here – early in the year those fish stage over the hydrilla,” Bolton said. “I’ve done it here in the past, and I know tournaments have been won here that way. When I got up around 26 to 27 pounds I started to leave. I thought, no, I’ll stay here just a little longer. Then I caught the 9-8 and I realized I was throwing back fish that were 5 pounds so I knew it was time to go. “Tomorrow I’m going to do the exact same thing that I’ve done the last two days and just go fishing and enjoy myself. That’s what this year is all about – me having fun,” Bolton went on to say. “Last year, I had no fun. I thought about retiring. So this year I decided I’m going to come back and get back to just having fun. Now, of course, catching 33 pounds helps to have fun. But, regardless, the secret to doing well is enjoying yourself. Don’t let the highs get you too high – and this is definitely a high. But there will be lows, and you can’t let the lows get you too low. Wicker earned Friday’s $500 Big Bass award in the pro division thanks to an 11-pound, 2-ounce largemouth. The fish was the 9th largest Big Bass Award winner in FLW Tour history. Overall there were 750 bass weighing 1,902 pounds, 8 ounces caught by 164 pros Friday. The catch included 136 five-bass limits. In FLW Tour competition, the full field of 170 pro anglers competed in the two-day opening round Thursday and Friday. The top 30 pros based on their two-day accumulated weight now advance to fish on Saturday. Only the top 10 pros continue competition Sunday, with the winner determined by the heaviest accumulated weight from the four days of competition.